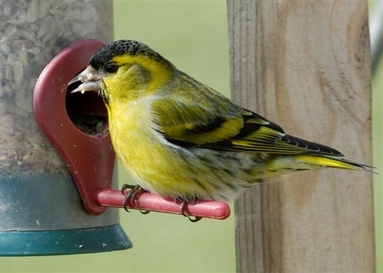 Siskins are small attractive acrobatic finches that, since the 1960s, have regularly visited gardens in the UK. The origin of their apt name is probably from Old German and means “little whistler”. Siskins breed from Scandinavia, the British Isles and Northern Spain across Europe and much of northern Asia to northern China and Japan. Early in 20th century, the Siskin was considered to be a specialist of pinewoods. However its small bill size is also well suited to feeding on the small seeds of sitka spruce and larch. Consequently, it has expanded its range, and is now found in most of the maturing conifer plantations created in the latter half of the 20th century. The wintering population in Scotland is highly variable and is influenced by natural food supplies both in Scotland and Scandinavia and other parts of the continent. During winters with poorer cone crops, the BTO Garden Bird Survey recorded an increase in records; conversely during good cone years numbers in gardens declined. The numbers of birds moving through Scotland from Scandinavia in autumn and returning in spring varies between years. Fluctuation in food supplies in their breeding area is one likely cause but the populations which breed in the north of Europe will also move to avoid cold weather. In 2007, the month in which I had most reports of Siskins in gardens in Arran was February, and in 2008 it was January with groups of up to fifteen not being uncommon. By contrast this year there have only been three reports of Siskins in gardens. However the national recording system, BirdTrack, noted at the beginning of March, that Siskins seem to be on the move and the numbers may peak this month. This species is certainly one to look out for in your garden, as many of these small birds try to gain sufficient weight to enable them to continue their migration to Scandinavia.